1) One person complained to the police that she had been threatened with death. The person making the death threat was a police informant, the police to the man’s home and TOLD him the female had complained. The man showed up later in the females home with a gun to kill her. Had he succeeded in killing her, the police would have been an accessory to murder, but then again our police are some of the biggest criminals in St Maarten, and everytime another one gets arrested, the people one by one will start to see the light. 2) A Haitian threw stones and busted a Locals house windows for NO REASON. The police were called, when the police did show up, the police stood in the broken glass and informed the victim that it was Sunday, so it made no sense to go to the police station, no one really worked on Sundays. They continued that even if the victim showed up, NOTHING would be done. They were pointed to the stone throwers home, the glanced at the house, and rather than arrest the perpetrator, they jumped in the vehicle and sped off to do what they do best- commit crimes and harass innocent citizens. 3) The St Maarten Police entered a locals home, and stole the taser that she used for protection out of her home. They committed more than just a crime, they violated a person in the most terrible way. When Chief Peter de Witte was confronted and recorded on audio about it. The Chief of police ADMITTED that his officers were committing crimes, but that people were not allowed tasers. So ask The Chief of police is so busy taking his monthly Checks from Mr Princess Casino, how can he worry about the ‘petty’ crimes his officers commit? Let me ask the people this.. What is the bigger crime? a) A defenseless woman who lives alone, keeps a taser hidden in her home. 2) The police wait until someone leaves their home. Illegally enters their home, clearly violating her as much as any burglar would, they enter her property, enter her bedroom go through her dirty laundry where she hid the taser, illegally stole it.. AND WERE RECORDED BRAGGING ABOUT ILLEGALLY ENTERING THE HOME AND STEALING PROPERTY..
4) Now I’ve already told everyone in Holland who will listen that I have HOURS of audio and video recordings of the Chief, Vandaam the whole gang. I had to record the police dept. 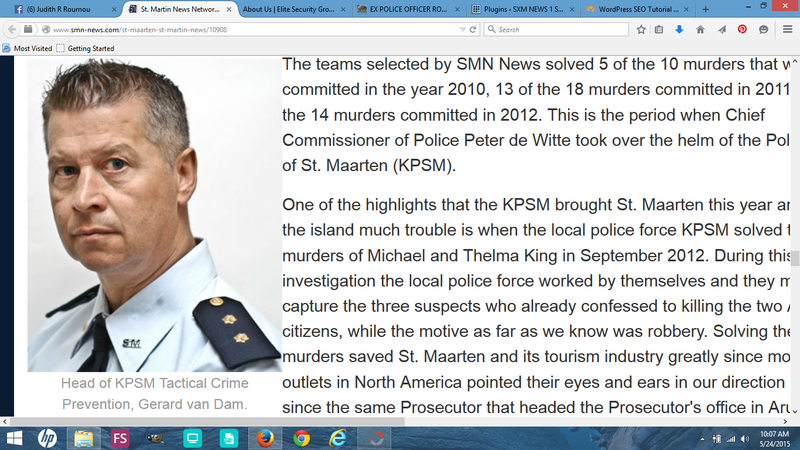 every word especially Vandaam and De Witte, because I realize that not only were they AWARE of the crimes that their officers were committing, violating St Maarteners, in some cases they PUT the police up to it, and since the Chief was busy collecting bribes, and committing bigger crimes… LOL! Of course they refused to investigate. 5) In St Maarten, people need to know that when you call the police, they RARELY show up! If they show up, they only show up to let you know that they can’t/won’t do anything. They leave you to DEFEND YOURSELF. When you defend yourself, they come to arrest YOU, how do these BASTARDS sleep at night? Oh, wait… They don’t! You can catch them drunk driving all over the place all hours of the night. They have to get wasted drunk, to pass out- to black out, in order to get any ‘sleep’! 6) Vandam and De Witte don’t/can’t believe in Karma. Vandam’s little side piece at the Courthouse WON’T be able to save him. SXM POLICE CONTINUE TO ABUSE AND ALLOW ST MAARTENERS TO BE ABUSED BY FOREIGNERS. This morning 11am, I had a dispute with a Spanish man where I live, And I was arrested by the police..
hands on him,.Not because I am faithful and humble now, means that they can walk over and on me and insult me? “MAFIA BOSS” FRANCESCO CORALLO’S CASE AGAINST THE KNIPSEL KRANT CURACAO, CONTINUES TO SPUTTER…..
Is he an alcohollic ?